Last week I read an article in the SocialTimes listing 5 reasons why Instagram stories will kill Snapchat. It is a bold claim to make so early on in a battle between to two. Here is why I think Instagram won’t kill Snapchat and what the early data is telling us so far. Let me start by saying this, I like Instagram stories, I really like it. I think it is a well made and a well thought out product. It is interesting to see how people interact with it and use it. Stories is intuitive and easy to navigate and understand. I love the UI, I think if there is one place where Instagram has excelled over Snapchat at the moment it is the UI. It looks clean and has a bit more polish to it. It kind of reminds me about how Periscope released in response to Meerkat and Periscope was a much more polished looking product. The placement of stories in Instagram is interesting as well, they are at the top of the feed so they really stick out and I think it will encourage people to create content there. However, anyone who thinks this is going to kill Snapchat probably doesn’t quite get what Snapchat has achieved even if they claim otherwise. Don’t get me wrong, Instagram stories is going to affect Snapchat but kill it? I really don’t think so. When Snapchat started out it won an entire generation of 13-18 year olds and when a social platform wins an entire generation of teenagers it drags everyone else down into it which is what we have seen over the past two years with the demographic expanding to be mainly 18-34 year olds. That demographic continues to expand. That doesn’t just vanish because Instagram comes out with a copycat product. 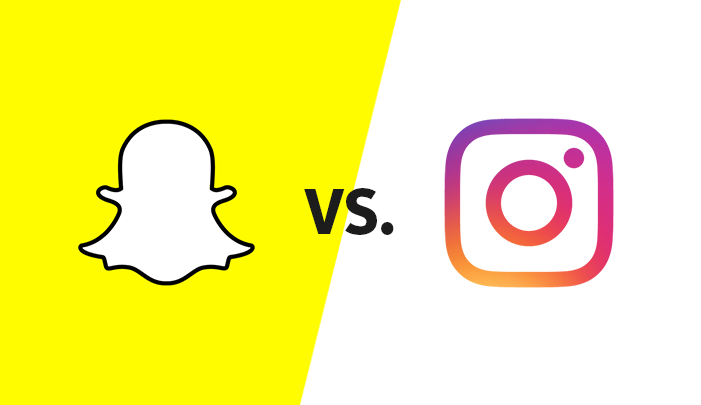 Plenty of people will remain on Snapchat because they prefer the UX or simply out of spite for Instagram being copycats. So while Instagram may take a bite of the audience, they won’t take the entire share of the pie. Snapchat and Instagram my have similarities but they also have differences too. Instagram is the place when you post your perfect shot, a quote or your fitness and health pics. Sunrises and sunsets. People have taken Instagram photos down because they didn’t get enough engagement in the few minutes they were up for. Snapchat is the more casual and laid back setting where people go to post raw moments that are happening then and there. What does the data tell us so far? Like I said, it is still early days in the battle between Snapchat and Instagram stories. However, what is the data telling us so far? Well there has actually been no decline in Snapchat usage yet. The data obtained from SensorTower is based on millions of users in more than 30 countries but maybe both platforms can co-exist and appeal to different markets. It does appear though that Instagram stories is struggling in one big area, viewer retention. Ziad Ramley works on the Al Jazeera social media team and shared his experience in a Medium post. He notes that because Instagram stories are higher quality, they are slower to load and as a result there is a big reduction in viewer retention. He says that Al Jazeera loses 40% of viewers by the second shot in an Instagram story. By comparison, there is not a similar fall in Snapchat until the 10th snap in a story. Snapchat has a lower resolution so it loads faster and as a result you can seamlessly go from snap to snap. He also says that while they have more Instagram followers, the view rate on stories is very low. Only around 10% of their 438,000 followers are actually consuming content on Instagram stories at the moment. What we can take from that is Instagram has some work to do yet, they are nowhere near close to even potentially killing off Snapchat. Even if you have a big following on Instagram it doesn’t mean more people are going to be consuming your stories and the retention rates are also going to be a concern for brands. People are debating it at the moment, Instagram stories or Snapchat? Buffer (my favourite social sharing tool) announced last week they were taking a step back from Snapchat. Now the reasoning Buffer gave for this is due to some hot water that Snapchat has landed in recently regarding racially discriminating filters. They say that even though Snapchat has apologised, this does not fit in with their values. I get it, I respect it, even if I don’t agree with the decision from Buffer myself. However a large part of me can’t help but think it is just as much tactics as anything else and they hope to capitalise on their Instagram following. Nothing wrong with that by the way if it is the case! Why pick one or the other though? Why not have them both? I have looked ay my audience on Instagram and Snapchat and I can tell you they are very different from each other. That of course means the content needs to be altered over the two. However, I am thinking about how I can get both platforms to work instead of choosing one over the other because my gut tells me that neither of them are disappearing any time soon.